In keeping with our mission of supporting Catholic education in Central Washington and using funds raised at the Celebration of Faith Event, the Central Washington Catholic Foundation is providing grants to assist parishes with their religious education programs. 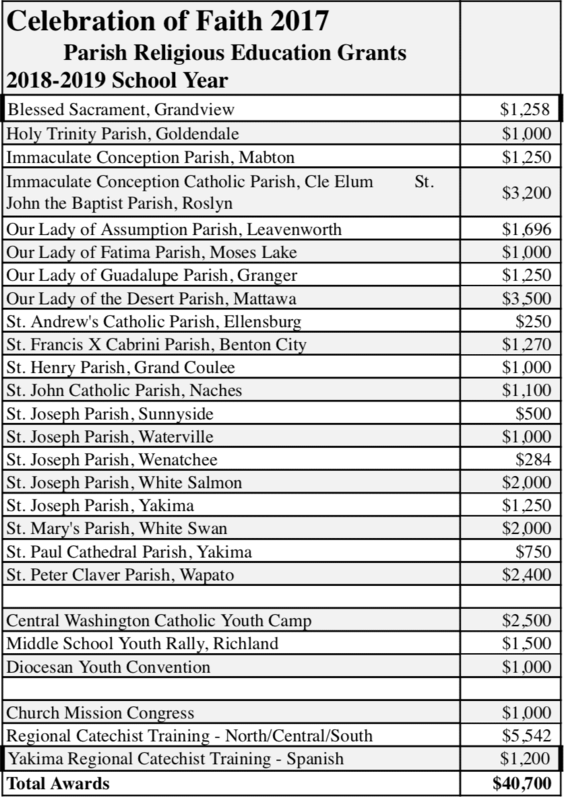 The parishes and Diocesan supported programs of Yakima are eligible to apply for funding for various needs of their religious education Programs that they would not otherwise be able to fulfill. Parishes of the Diocese of Yakima are eligible to apply for $500 Stipends for volunteer RE Coordinators with a required $500 match. Parishes may request a single $750 stipend for religious education Training. Deadline for all Parish Religious Education (PREP) Grants is May 1. Contact the office at (509) 972-3732 for more information.